Here it is, people! The 2013 updated version of last year's début edition. 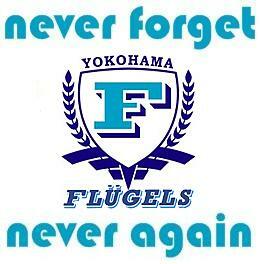 Watching Football in Japan 2013. So, how's it different? Let me tell you. 30% more pictures. Greater in number and better looking. Several J2 stadia now profiled along all of 2013's J1 stadia. More information, updated where relevant. All purchases can be made directly via Blurb. Click here to visit our Blurb book store. Significant discounts can be made by a quick websearch for coupons. Click here for various coupons. I once made a saving of nearly $100 on a bulk order, so it's really worth your time having a quick look. Regarding the PDF, please get in touch directly at barryvalder@hotmail.com, or leave a message here and we can sort that out. Any questions, please don't hesitate to ask! When can we expect kick off times and the rest of the fixtures? Next Friday afternoon. It seems we have this whole first-couple-of-weeks-getting-leaked process every year. Are they really they badly organised? So it would appear. In addition to the above dates-for-your-diary, here's a couple more. Once we're back from Kagoshima (more details here), we have Jubilo on February 16th at the Ashitaka athletics ground in Numazu. We play pre-season games there from time to time, but it's by no means an alternative for Nihondaira. Check it out a little here, or you can see an above shot here. Three banks of grass is pretty old skool, and if it was warmer I'd quite fancy spreading out with a few beers while watching S-Pulse take Jubilo apart. Anyway, another friendly, this one at Nihondaira, has been organised against last-day-of-the-season survivors Albirex Niigata (who, it's worth remembering, stayed up at Gamba Osaka's expense!). The game is Sunday, February 24th and kicks off at 2pm. There's also a reserves game before if you're interested in that sort of thing. While I'm here, it was announced that Takagi has signed a new contract, which is of course excellent news. Can't wait to so see how he compliments new signing Bare. I've also been reading all kinds of rumours regarding further signings, so I don't think we're done yet. Stay tuned! Afternoon all! The season may be over, but there's been plenty of activity off the pitch the last few days. Here's a quick round up. Firstly, our season will start away to Omiya on March 2nd after the opening fixtures were leaked last week. Kick off time is set to be confirmed along with the second week's fixtures on the 22nd. The full fixtures are expected at 5pm, Friday 1st February. Why they can't manage to do it all in one go is anyone's guess. Anyway, as soon as the fixtures are out I'll get them up here. Or more likely, I'll initially make them known on Twitter. 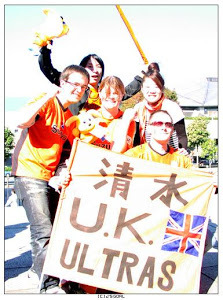 (@spulseukultras) The UKU are planning a pre-season meeting the night of the 1st to plan away days for 2013, so a full list on here may be the next day or so. Oita looking like fun, and maybe a Tosu in there too? Can't wait. New Year - New Signings! Happy new year! I hope you all had a wonderful Christmas and New Year's Eve. May I also wish you all the best for the upcoming 12 months. I was away this last week in San Francisco enjoying the wedding of two great friends (not to mention whale watching, redwood trees, clam chowder, cable cars, some of the many local beers - the list goes on), so we have some catching up to do! The biggest news is the capture of prolific goal scorer Bare. He scored over 100 goals over six seasons in Japan from 2003-08, which is an impressive average of 17 a season. Could he be what we've been missing? Another incoming is Kenta Uchida. 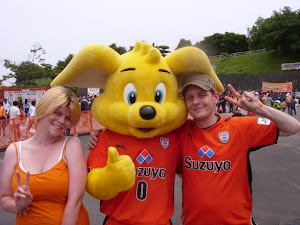 A midfielder signed from Ehime FC. The 23 year old has been an important part of the Ehime set up these last two years, so I'm looking forward to seeing how he makes the step up. Players who were out of contract but have signed extensions include, most notably, Kawai, Jong-a-Pin, Lee, Ishige, Muramatsu and Hiraoka. There's been some out goings too. Firstly Tsujio, who was on loan at Hiroshima, has been released at the end of his contract and has joined newly promoted Oita Trinita. Secondly, keepers Yamamoto and Usui have joined J2 teams Kobe and JEF Chiba respectively.